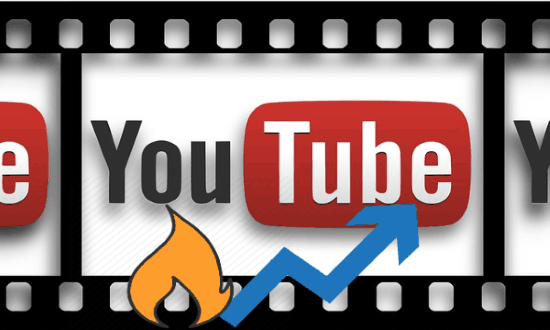 This tutorial will demonstrate how to see top 50 trending YouTube videos from different countries. There is actually a free website called “Popular50” which allows you to easily find out the top and trending videos people are watching on YouTube from various countries. You have the option to pick any country you want and then it will automatically curate a list of top 50 videos which are trending. It supports 40 different countries including the United States, Colombia, India, Great Britain, and more. 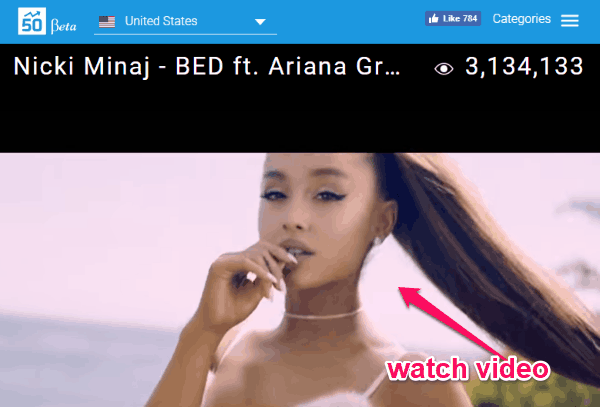 Apart from showing you the videos, it also lets you see video details (like views, likes, etc.) and also watch them on the website. You can even filter the trending videos by different categories like sports, music, entertainment, comedy, etc. So, if you ever wanted to know which YouTube videos are popular among people of any specific country, then this tutorial can help you exactly do that. You may also like our tutorials on how to add comments to YouTube video timeline with photo/GIFs and filter YouTube videos by length. To get started, simply visit the homepage of Popular50 and then you can see the option to choose the country at the top left corner. 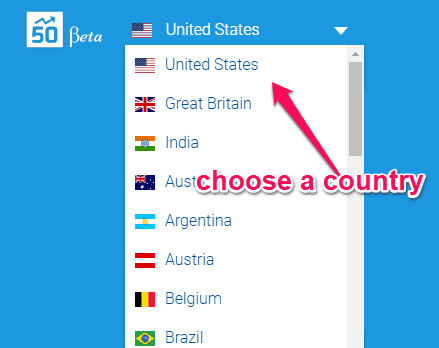 Click on the drop-down menu and then choose any country you want from the list. The list exhibits 40 countries including the United States, Great Britain, India, Australia, Argentina, Belgium, Brazil, Austria, Canada, Columbia, Japan, Malaysia, and so on. As soon as you select the country, it will automatically find the top 50 YouTube videos and show them to you. The videos will be scattered into 3 different categories named, Hot Trends, Popular Trends, and Rising Trends. You can easily explore these categories in separate tabs and see the videos. For each video, you can also see other details like the total number of views, likes, and dislikes. You can also play the videos directly on this website just by clicking on them. The videos are played using the YouTube’s native player. This way you can choose any supported country you want and see the top 50 trending videos which people are watching on YouTube. 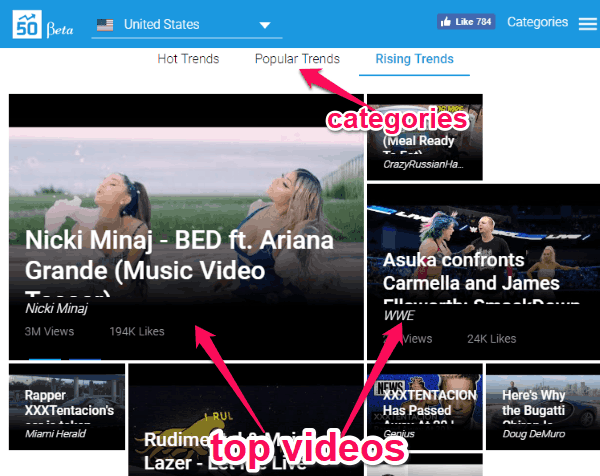 Another useful feature of this website is that it allows you to filter the trending videos by different video categories such as Autos & Vehicles, Comedy, Entertainment, Film & Animation, Gaming, Music, etc. To select a category, simply click on the “Categories” menu at the top right corner and then select it from the list. 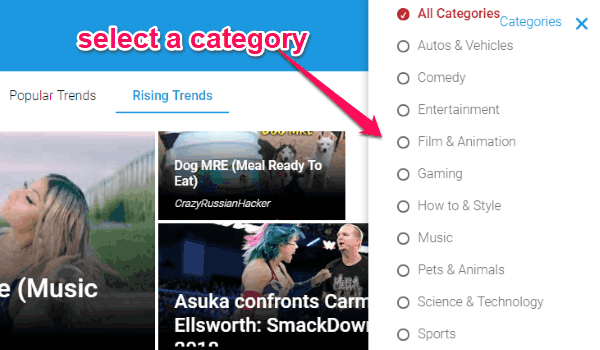 Once you select a category, it will show the top 50 trending videos of that particular category only. So, this is how you can find and see the top 50 trending YouTube video from 40 different countries. Popular50 makes it quite simple for you to do that. Just choose a country and the trending videos will be presented for you to see and watch. Go ahead and give it a try.